Cross-posted from Hisayo Horie’s blog, our wonderful Outreachy intern for the last 3 months. Officially I finished my internship with Open Australia Foundation, and I already miss working with OAF so much. I learned so much about programing and development, as well as community centred technology, challenges, and most importantly where I stand and where I want to go. The project I worked on (and will most definitely keep working as a contributor) is councillor data contribution project (we did not find a cooler name for the project in the period of my internship, but I believe it can still happen). 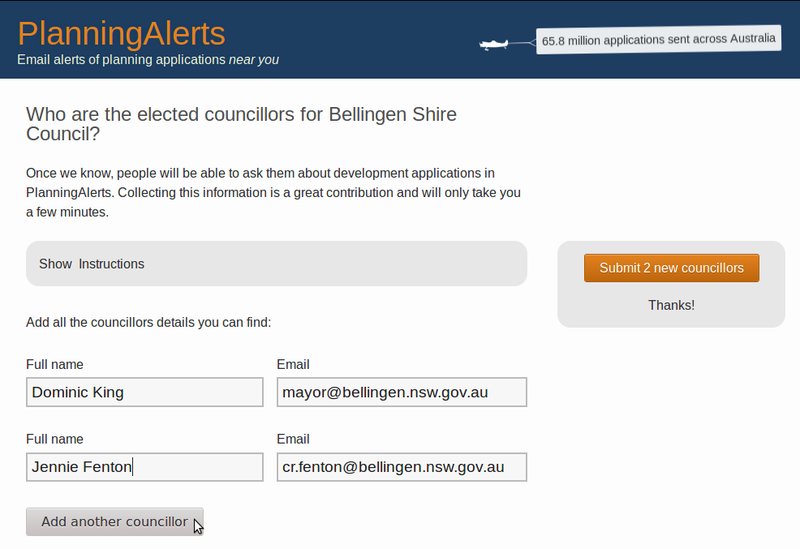 The project is about creating a user-friendly system and interface to enable volunteer contributions to keep an Australian local councillor database so that other apps can be fed by the database. I really like this project because it is about expanding and diversifying the participant base of civic tech. One of the challenges in civic tech is the critical lack of community participation and consultation in the process. It is interesting in some way (not in a good way) when a group of social justice minded developers create apps to solve social issues without consulting the area experts or people who are the most affected by the issue, nor attempting to create a process that lets those people actively participate to be a part of the solution. Deconstructing this divide between tech people and non-tech people is a key to create community-centered technology. And I believe the best way for deconstruction is the construction of something to actually address the challenge better. In the case of our project, to create a system that makes the contribution possible without technical knowledge. Another thing that is important about this project is the process. If we create something to challenge the issue of exclusion, our development process needs to reflect the value and the goal. Before start coding, we spent about 2 weeks to figure out our design principles and the goal. Although I felt an itch to rush the process to get on coding, I am glad we spent the time to build the solid foundation of the project. It is truly great for me to work on the project that addresses an issue I personally care for, and even more so because the team I worked with was just unbelievably amazing. Luke and Henare are both very patient, willing to teach, and VERY particular in how we write code. And that‘s what I want from mentors. They definitely exceeded the expectation. I learned a lot not only about rails (the framework we use for the app), but also about communication and version control using git, and reason why it is so important. I missed the official application deadline because I spent too much time questioning if I should apply or not. I thought I wouldn’t get it anyways because I am not experienced enough. It was a fortune that OAF had an extended deadline, because they joined later. I saw they are using Ruby on Rails, and decided to give it a shot. I am so happy I did as I ended up working with great people for a great project, and I learned tons. At that time, I was on the fence about giving up a career in programming because no matter what I try, the door doesn’t seem to open for me. And probably I was not settled with the decision myself. The leap I made from community work, art-based education and storytelling was very big, and in previous work I mostly worked with black, indigenous, and people of color who do not shy away from being political because we have to to survive. I was struggling to see myself in the corporate world of tech. And to be very honest, it is not easy for people like us out there. Even within the carefully worded eligible candidates of Outreachy, (“You identify as a woman (cis or trans), trans man, or genderqueer person (including genderfluid or genderfree)”), we need to acknowledge there are big gaps among these group in terms of access, level of surveillance, and even the resources (i.e. other privileges) to capitalize on these oppressed identity markers (and this happens all the time in the time of diversity industrial complex). There are not that many opportunities out there for us, and these internships are a few of them. This is the first time I felt seen in my experience of tech industry. Through this internship, I came to realize that technology doesn’t and shouldn’t only belong in the corporate industry, because technology also is a culture. We need to build the culture of technology that is truly inclusive and welcoming, and to work to build technology for social good. I had long forgotten why I started to learn code, and through this internship I remembered. I started to learn code because I wanted to advance my art-based education practice. I wanted to write code to contribute in creating technologies in hands of people who are at the margin. Although there is a lot that needs to be done and change, I also started to see the ways to contribute to nurture the culture of social justice from inside of the industry, and started to meet people who are working for it too. This internship was life changing. The biggest thank you for Luke Bacon, Henare Degan and Outreachy for making this possible. I will be around to make more contributions in OAF projects! This entry was posted in Development, Outreachy, PlanningAlerts.org.au and tagged Ask Your Councillors, civic tech, coding, diversity, Git, Henare Degan, hisayo horie, internship, Luke Bacon, outreachy, planningalerts, Rails, Ruby on Rails, tech industry. Bookmark the permalink. Post a comment or leave a trackback: Trackback URL.